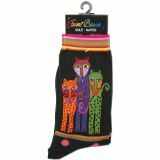 Laurel Burch Socks - LAUREL BURCH-Socks. These Laurel Burch socks are designed with her magically uplifting whimsical creatures. The bright colors, fun images and the practical construction of these socks make them popular all over the world. Find the pair that matches your Laurel Burch Tote and make a Big statement! Socks are made of 70% cotton/20% nylon/10% spandex and come in women's US size 9-11/EUR 36-40. Care: Machine wash warm, tumble dry low. Imported.